I didn't name them but I do agree with the title. These sausage bites are indeed super. The recipe is from Gooseberry Patch's Taste of Autumn, copyright 2004. I've been making this dish for almost six years now. It the first Gooseberry Patch recipe I ever made and it's still a winner! 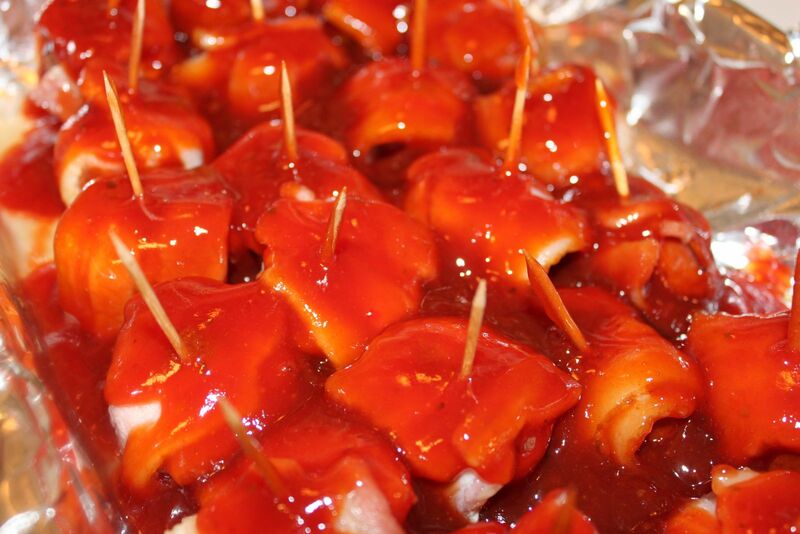 These sausage bites are perfect for your tailgating and Halloween party needs. If you try them, I think you'll be hooked, too. 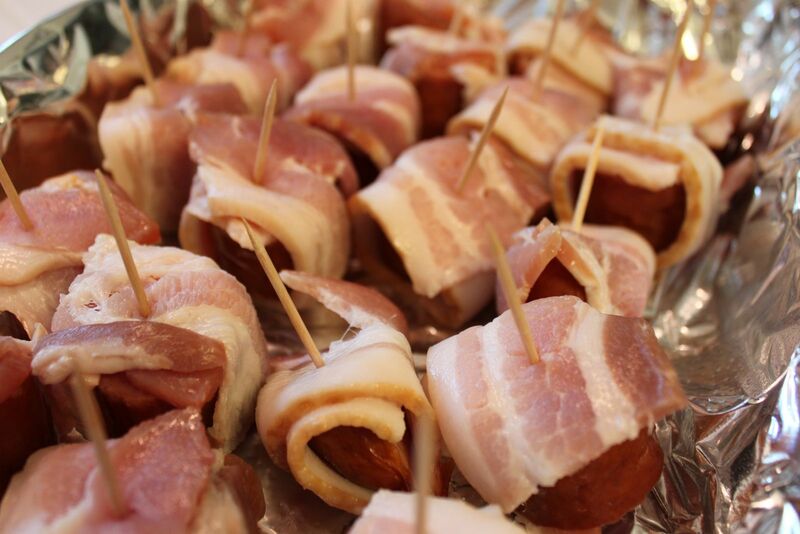 Wrap one slice of bacon around each piece of sausage; secure with a toothpick. Place in an ungreased 13"x9" baking pan; bake at 350 degrees for 30 minutes. Set aside. 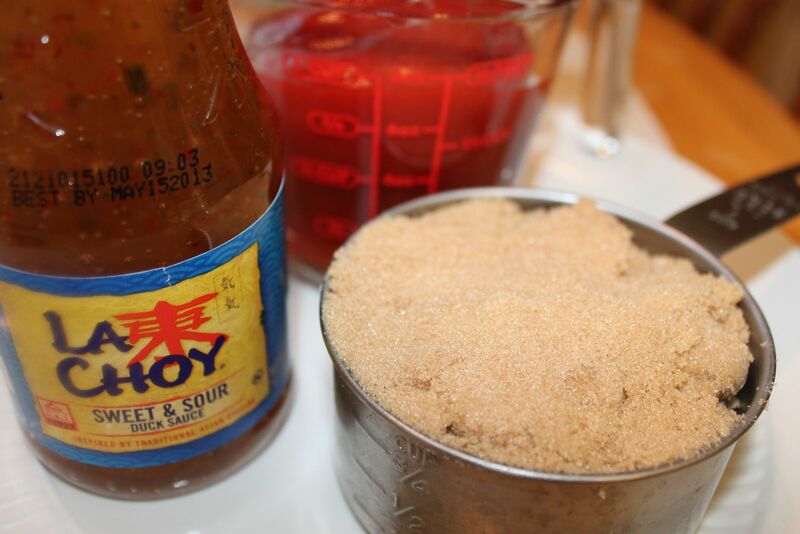 Mix remaining ingredients together; pour on top. Bake for one additional hour. Makes 2-1/2 dozen. Now, since I've made this dish so many times, I have a few hints to make this simple dish even easier. First, I cut the bacon in half. Then, I count the number of pieces of bacon that I have. 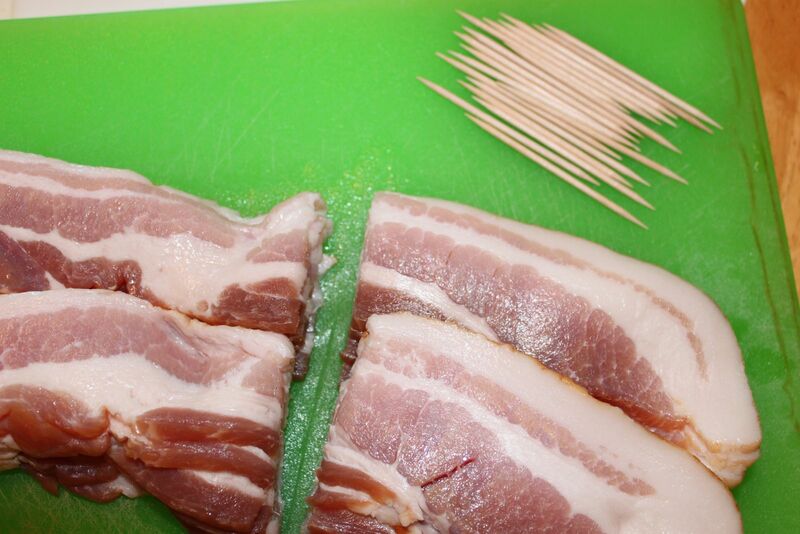 Once I know how many pieces of bacon I'm dealing with, I count out the correct number of toothpicks and set aside. I don't like to stop in the middle of the wrapping process to grab more toothpicks. Now that I know the amount of bacon I'm working with, I cut the kielbasa to equal the bacon. Now, see...doesn't that make things easier? Here's what the sausage bites look like when they're ready to go into the oven. I always line the pan with foil. The sauce will be very sticky. Trust me! You'll thank me when it's over. While the sausages are cooking for the first thirty minutes, I like to go ahead and make up the sauce. It's an easy sauce, only three ingredients. Now, here's another little hint. Before you add the sauce, try to drain off as much fat as possible. Once you add the sauce, put them back in the over for another hour or so. I like to start keeping an eye on them around the 40 minute mark. 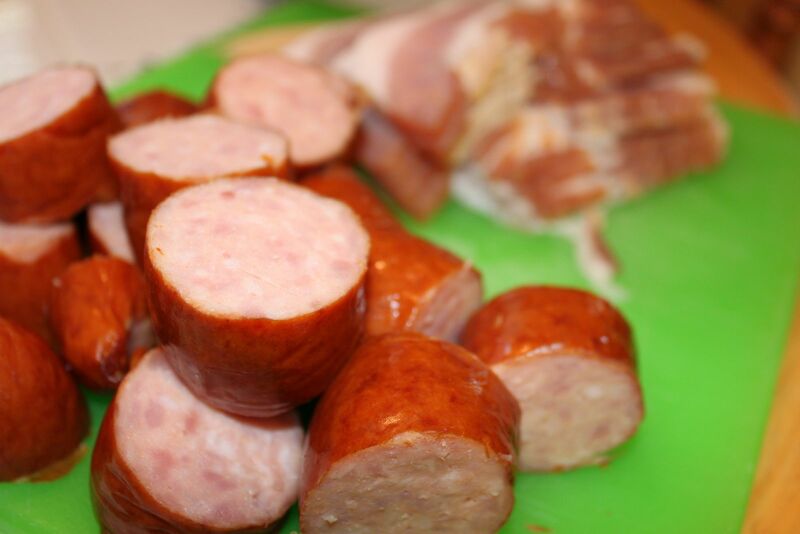 After the sausage bites are done, I like to remove them as quickly as possible to a serving dish. At this point, you will be thanking me for the foil lining. 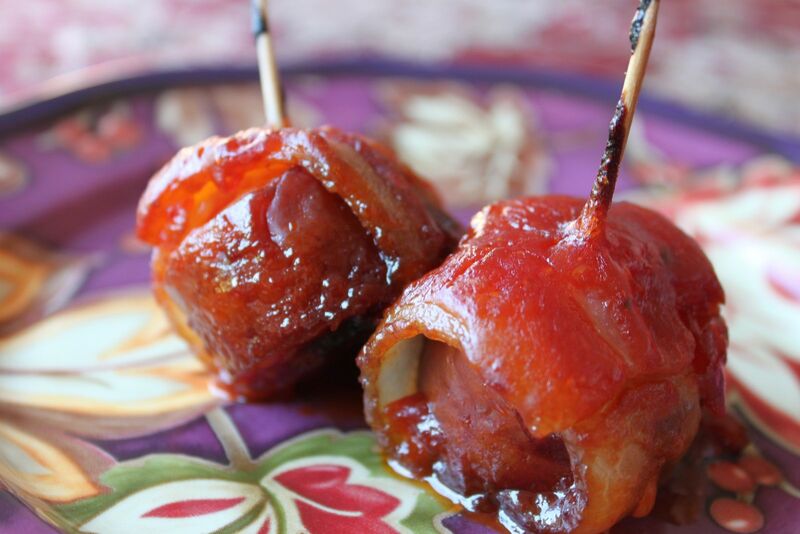 Really, anything wrapped in bacon is better, right? 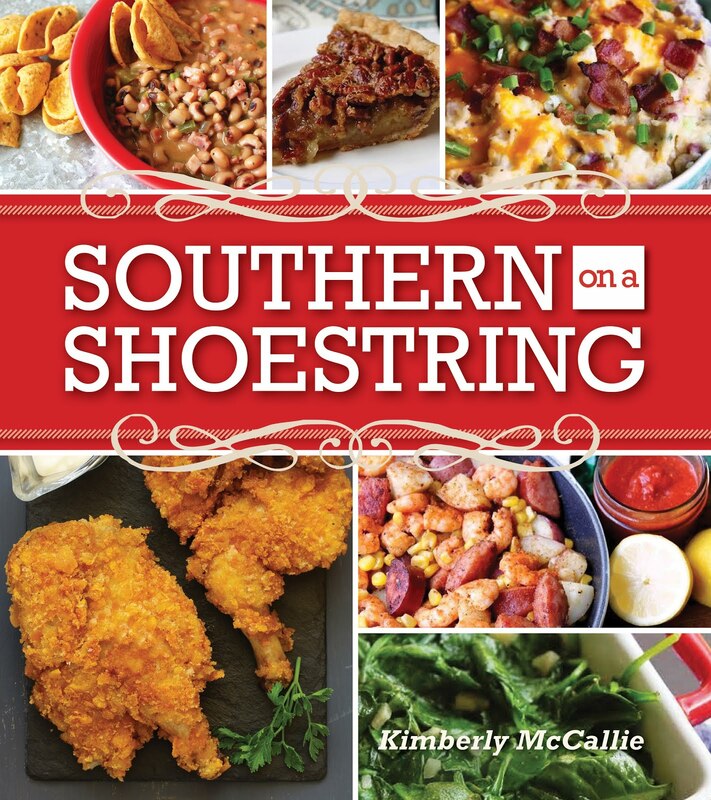 ;) Thanks for sharing another yummy recipe...and your helpful tips too! this would be perfect to take to my ladies meetings at church !